Ceferino Montano Garcia was a champion boxer born in Naval, Biliran, Philippines. He holds the most victories ever achieved by a Filipino boxer and is also the only boxer from the Philippines to become world champion in the middleweight division. Garcia is commonly credited to as the first well known user of the bolo punch, which was later popularized by Cuban fighter Kid Gavilán. He was inducted into the Ring Magazine Hall of Fame in 1977 and the World Boxing Hall of Fame in 1989. Luis Villanueva Paramo was a Mexican boxer best known as Kid Azteca. Villanueva boxed professionally from 1932 to 1961, making him one of a small number of fighters that fought during four decades. Archie Moore, George Foreman and Roberto Durán are three other fighters in that exclusive group. Ralph Giordano, better known as Young Corbett III, was an Italian-born American boxer. He was the World Welterweight Champion in 1933 and the NYSAC Middleweight champion in 1938. A tough southpaw, he did not have strong punching power but was known for his great speed and determination. 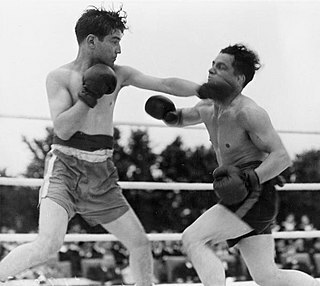 Corbett is considered one of the greatest southpaws of all time and one of the all-time great counterpunchers. He was inducted into the Fresno County Athletic Hall of Fame in 1959, the Italian American Sports Hall of Fame in 1982, and the International Boxing Hall of Fame in 2004. Cornelius Boza Edwards is the former WBC Super Featherweight Champion of the World. Boza Edwards was a Ugandan, and fought in both the Super Featherweight and Lightweight divisions. Edwards emigrated from Uganda to England, where he lived for a long period. He currently lives in the United States, where he trains other boxers. Howard Edward Davis Jr. was an American amateur and professional boxer. Growing up on Long Island as the eldest of 10 children, Davis first learned boxing from his father. After being inspired by a movie about Muhammad Ali, Davis embarked on his amateur career. He won the 1976 Olympic gold medal one week after his mother died. He was also awarded the Val Barker Trophy at the Olympics, beating out such boxers as Sugar Ray Leonard, Michael Spinks and Leon Spinks. Regilio Benito Tuur is a former boxer from The Netherlands, who was WBO super featherweight champion. István Kovács, nicknamed Ko-Ko or sometimes The Cobra is a Hungarian retired world champion boxer. Pieter ("Piet") van Klaveren was a boxer from the Netherlands, who competed for his native country at the 1952 Summer Olympics in Helsinki, Finland. There he was stopped in the quarterfinals of the Men's Light Welterweight (-63.5 kg) division by Terence Milligan of Ireland. He is the younger brother of Bep van Klaveren, Olympic boxing champion in 1928. Patrick ("Pat") Cowdell is a retired boxer from Great Britain. Cowdell now lives just over the border from Smethwick in Oldbury. Terence "Terry" George Spinks MBE was a boxer from Great Britain, who won the gold medal in the flyweight division at the 1956 Summer Olympics in Melbourne, Australia. In the final he defeated Mircea Dobrescu of Romania on points. He was also British featherweight champion from 1960 to 1961. Víctor Peralta was an Argentine boxer who competed in the 1928 Summer Olympics in Amsterdam, Netherlands. He was born in Buenos Aires. Harold "Harry" George Devine was an American boxer who competed in the 1928 Summer Olympics. Victor "Vic" Anthony Toweel was a South African boxer and former undisputed World bantamweight champion. He was the first South African to hold a world title. Louis "Lou" Daniel Laurie was an American boxer who competed in the 1936 Summer Olympics. Francesco Musso is a retired featherweight boxer, who won a gold medal at the 1960 Olympics in Rome. The same year he turned professional and retired in 1966, with a record of 24 wins and 4 losses. He never fought for a major title, and never fought outside of Europe. Willie Michael Toweel was a boxer from South Africa, who won the bronze medal in the flyweight division at the 1952 Summer Olympics in Helsinki, FInland. Joseph Ventaja was a French boxer who won the bronze medal in the featherweight division at the 1952 Summer Olympics in Helsinki. He was born in Casablanca, Morocco. Dave Needham was a British boxer. He was a Commonwealth Games gold medal winner and one of the few boxers to have held both the BBBC bantamweight and featherweight titles. Thomas Patrick Donovan was a New Zealand amateur boxer and rugby union player. He represented his country in boxing at the 1956 and 1964 Olympic Games, and won bronze medals at the 1958 and 1962 British Empire and Commonwealth Games. He also played representative rugby for Hawke's Bay. Henry William Coleman, better known as Harry Corbett, was an English boxer who was British featherweight champion between 1928 and 1929, and also fought for titles at bantamweight and lightweight. Don Diego Rivelino Alfredo Poeder is a former Dutch professional boxer. He is known as the only Dutch professional boxer that won a world title as a professional undefeated. After his debut in 1994, Poeder was undefeated for 21 consecutive boxing matches. Juan Muñoz was a Spanish boxer. He competed in the men's featherweight event at the 1928 Summer Olympics. In his first fight, he lost to Bep van Klaveren of the Netherlands. Wikimedia Commons has media related to Bep van Klaveren .